Happy New Year Everyone! I hope you had a great holiday and are looking forward to a great year. As I look at where I am now in relation to the start of 2015 I can't believe how much has changed for the good. At the beginning of 2015, I was still heartbroken over the death of my husband, just laid off from my job because of my company closing with no job prospects, and feeling like it was the loneliness and most challenging time of my life. Added to that I knew I'd have to adjust to living alone in September when Anna Li left for college. Literally everything important in my life had changed or was going to change. Now I have a job I really love (although it doesn't pay well) as a part-time contract nonfiction writer for attorney websites, have adjusted to Anna Li's move to college and watched her blossom as an adult, and am in a relationship with a great new guy who makes me happy. I can't believe how good life has become. It's SO amazing!! I'm really looking forward to more happiness and good things in 2016! I hope you are too. Today I’m excited to have debut author Kathy MacMillan here to share about her YA fantasy SWORD AND VERSE that releases on January 19, 2016. It’s been compared to Megan Whalen Turner’s books—a favorite of mine—so I’m definitely excited to read this. I wanted to read the ARC but have not been able to load it onto my new Amazon Fire from Edelweiss. Anyone know how to do this? I'd appreciate the help. Hi Kathy! Thanks so much for joining us. I am a librarian, storyteller, and an American Sign Language interpreter in addition to being a writer. I guess you could say I love language! In the early 2000s, I was active in the Harry Potter fandom as one of the administrators of the Sugar Quill (http://sugarquill.net/). I also wrote a LOT of fanfiction. Writing fanfiction gradually morphed into writing original fiction. 2. Harry Potter got me into writing too. Where did you get the idea for your book? While researching for an article on book burning, I came across a reference to ancient libraries composed entirely of letters. I scribbled in the margin of my notebook, “What if they were letters to the gods?” The Library of the Gods was the starting point of the story. 3. What an awesome way to get a story idea. The reviews of your book really praise the depth of your world building. Share about how you developed Raisa’s world and any tips for other writers trying to create a new world for their stories. 4. Okay, you're making me feel better about admitting I revised my first book for about 10 years. I loved how you made the stakes so high and difficult for Raisa: help the slaves like her and stay faithful to Prince Mati who she loves. How did you build on your stakes and keep the tension mounting? that Raisa is not a sword-wielding tough girl – and it was very important to me to stay true to that, because, while kickass heroines are great, that’s not the only way to be strong. Raisa is the kind of girl – and we all know women like this – who might appear meek on the surface but has a will of iron underneath. But that also meant that action was not her default mode, so I had to force her into situations where she had no choice but to act. This is an area where agent, editor, and betareader feedback was invaluable. 5. She sounds like a fantastic character I want to get to know. Are you a pantser or plotter and why do you think that works for you? I think I am a combination. I usually start out doing a lot of research and world building, making tons of notes, and focusing on the characters and their backstories. I do make an outline of sorts, but it’s not so detailed that I consider myself a true plotter. Usually when I start a first draft, I have a good idea of the emotional beats of the story, but not of the plot itself. The first draft, for me, is all about figuring out the characters and how they relate to each other. Plot is something to be cleaned up later. As I write, there are many turns that come up that I don’t anticipate. In fact, there is a moment near the end of Sword and Verse that several readers have cited as their favorite moment in the book, when Raisa does something that surprises everyone around her. While I was writing it, I was just as surprised as the characters in that scene, because I’d had no idea she was going to do that either! 6. I'm a combination too. Your agent is Steven Malk. Share how he became your agent and your road to publication. 7. That's awesome he took over for Lindsay. I read on your website about your launch party, and it’s a really different way to do it. Tell us about it and why you chose to do it that way. Since 2001, I have been involved with a wonderful non-profit organization called Deaf Camps, Inc. (https://deafcampsinc.wordpress.com/), which provides completely accessible camps for Deaf children and American Sign Language camps for new signers. I knew I wanted to have a big party for my launch – this has been a long time coming, and I want to celebrate! - and what better recipient of party love than the organization I adore? So I am putting on a gala fundraiser event to benefit Deaf Camps, Inc.’s scholarship program – a fancy dinner, book signing, silent auction, and everything will be completely accessible in American Sign Language and English. Sword and Verse is all about communication and access to knowledge, so it feels especially fitting to celebrate its launch in this way. 8. That's SO fantastic! What’s something that has surprised you about the publication process? How long it takes, and how much waiting is involved. Sword and Verse will be published 10.5 years after I started submitting it, and 7 years and 6 days after that first email from Lindsay Davis. 9. I admire how you stuck with it given how long it took to get your book published. What are you working on now? I am working on the follow-up to Sword and Verse. Many people have been excited about the fact that Sword and Verse is a standalone, and it does function as a complete story in itself. I had never intended to write a sequel, but these characters, apparently, weren’t done with me. The second book picks up not long after the first one ends, and it is from the point of view of Soraya Gamo. The story deals with the consequences of the choices made in the first book. https://kathymacmillan.wordpress.com/ or on Twitter at @kathys_quill. 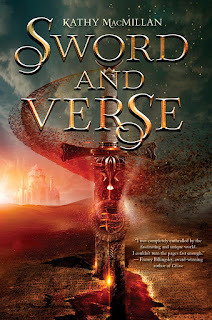 Kathy has generously offered an ARC of SWORD AND VERSE for a giveaway. To enter, all you need to do is be a follower (just click the follow button if you’re not a follower) and leave a comment through January 16th. If your e-mail is not on your Google Profile, you must leave it in the comments to enter either contest. If you mention this contest on Twitter, Facebook, or your blog, mention this in the comments and I'll give you an extra entry. This is for US and Canada. 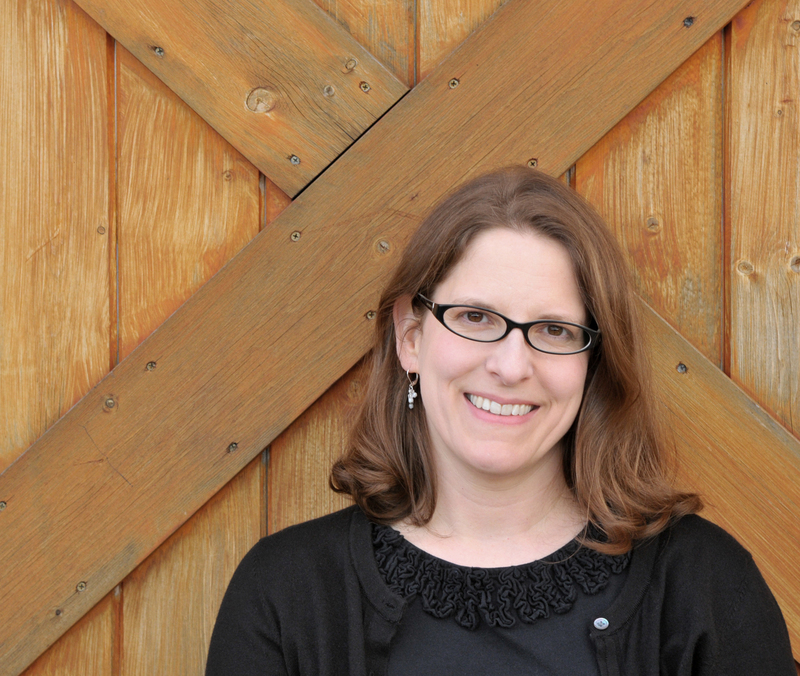 Next Monday I have a guest post with debut author Monica Tesler Bounders and her agent David Dunton with a giveaway of her MG science fiction BOUNDERS and a query critique by David Dunton. Friday that week I'll be participating in the Dreaming of Books Giveaway Hop. I'll have lots of great books or an Amazon Gift Card for you to choose from. The following Monday I have an interview with debut author Lois Sepahban and a giveaway of her MG historical fiction PAPER WISHES. The Monday after that I have a guest post by Gregory Funaro and a giveaway of one book in his MG fantasy Alistair Grim’s Odditorium series. What a wonderful post to kick off the new year! I knew about all of the good turns in your life in recent months, Natalie, but it's still great to see your happiness shared here. And I loved this interview - I related to so much of it, from all of the revising to the many years to publication. This line was great advice for me to follow in my own writing: "But that also meant that action was not her default mode, so I had to force her into situations where she had no choice but to act." Natalie, I'm very happy for you that 2016 is starting so much better. Kathy's very fortunate another agent took over when hers left. Many writers would find themselves at square one again. I LOVE the premise of this novel. 87 revisions! That is about the most inspiring thing I've heard about in a long time. I needed to read this as it will help spur me on, help to motivate me. Thank you, Kathy! And Happy New Year, Natalie. I'm so glad the changes in your life have led to joy. So glad you have positive things going, Natalie! Hugs to you and best wishes for more wonderful things! Congratulations to Kathy! That is a whole lot of revisions!! Kathy's journey to the published ranks was a long road but one that many of us follow in our own writing. Thanks for the interview, Natalie, and have a happy 2016. You are already off to a great start. Happy New Year, Natalie! So glad to hear you're looking forward to 2016. Sounds as if it will be a fun year for you. Great interview. I'm so impressed that Kathy went through 87 revisions and never gave up. What a journey! She sounds very organized too, with the worldbuilding chart. I loved reading about your daughter's transition to grown up lady, even though that had to be a major change for you. And congratulations on the new job and the great new relationship. May 2016 continue to be positive and happy. I hope Kathy's book takes off like a rocket! Wow! 87 Revisions! that's some serious dedication. From the ARC reviews I've seen so far, it was definitely worth it. I can't wait to read this book. Thanks for the giveaway! Wow I can't believe it took her over 10 years to get the book published. But you have to wait for all good things right? ;) Thank you for the giveaway! Wishing you a happy and healthy year, Natalie. Thank you for the interview, Kathy! So glad things are going well for you, Natalie. Impressed by Kathy's patience. Natalie: so happy to see things working out for you in your day and writing life. You deserve the good things. Happy New Year! I'm so sorry your husband died--hopefully this year will be a much easier year for you. That was a long time from start to finish, but it will be worth it! Natalie, good to hear life is much better now. Love how those What If questions lead to the most interesting stories! Great interview and congratulations to Kathy. I can relate to waiting. And what a fabulous idea for a launch party! As a former Harry Potter forum moderator, I totally get how HP can lead people to writing. I know so many fans who began writing because of that series. Just preordered the audiobook. I'm excited to listen to it. This book looks amazing! Thanks for the post and the giveaway! I would love to enter! :D thank you these look awesome!! Oh, Natalie, I'm so happy to hear how things are going for you! Sounds like 2016 will be a great year. And congratulations to Kathy! Sounds like a great book, although my reading stack is full right now so don't worry about entering me in the giveaway. Hi Natalie! Glad that things are going well for you. :) Thanks for the interview! This book looks great. Can't wait to read it. What a great interview to kick off the new year! Love the story behind what sounds like a gorgeous and intriguing book. Congratulations Kathy, and glad to hear that things are on the upswing for you Natalie! Natalie, you are a tremendous source of inspiration! You are so strong and giving and I'm so happy to know you. Thanks for everything! Thanks for doing this interview - I didn't know much about this book, but was intrigued by the cover. Now I'm even more interested in checking it out! Congrats, Kathy! On another note, I'm glad that the year has brought good things to you: a new job, a daughter making her way in life, and a new relationship, after such deep loss. Best wishes for all good things in the coming year. Wow! 87 revisions! I love fantasies! Congrats on your new release and thank you for the giveaway! I can't wait to read this one!! So nice to hear that your life is back on track. This will be a good year for you, I'm sure. Thanks for this wonderful, informative interview. Please let someone else win, though. Buried in books here! I love Kathy's comments on her depth of world building and number of revisions. Next to non-cliche characters, I find world building most important. Wishing her much success! Natalie, life changes on a dime, doesn't it? I'm glad things are changing for the better. You are epic. Kathy's book sounds wonderful. My 10 yr old would eat it up. Maybe I should introduce her, eh? I'm so happy that it looks like your 2016 is shaping up to be a good one, Natalie. Congrats to Kathy! Fan fiction was how I got into writing too. 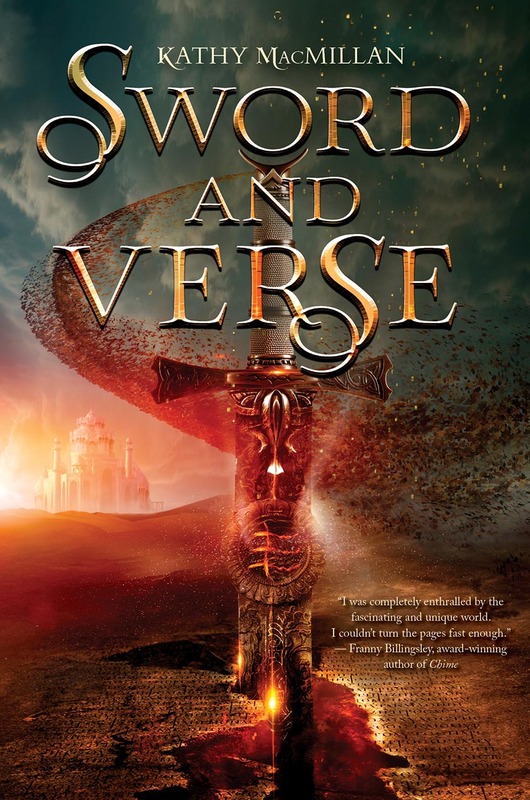 I love the cover and idea behind Sword and Verse. What a year, Natalie! I love the hope in your words. Here's to a grand 2016 for all of us. :) Congratulations to Kathy. I wrote Harry Potter fan fiction too. It's still out there on the net... under a different name, though! I love hearing where authors find their ideas. This was great. Natalie, I'm glad things picked up for you last year and that you are healing from the loss of your husband. Kathy, congratulations on your book! I was particularly interested in learning about what you do for the deaf community. Happy New Year! This book sounds amazing and I'm adding it to my TBR. Happy New Year! I'm so glad that so many things are going well for you, Natalie! It's wonderful to hear your good news. And, Sword and Verse sounds great! Hi Natalie! I'm glad you're moving forward in 2016. Time helps for sure. I wish you great happiness in your new relationship. Natalie, I'm so glad you are doing well. I was thinking about you and Anna Li just the other day. I'm in awe of how you are taking on life. Kathy's interview was super. Lucky lady to get Steven Malk as an agent by default!!! Best wishes with your book. Raisa sounds like a wonderful character. Natalie, I'm so happy to hear that you're in a good place! Ladies, thank you for the interview~ the book sounds amazing and your publishing journey is inspiring! Would LOVE to win this! Really great interview with Kathy! Her book sounds terrific. And wow, on Steven Malk. I've heard some amazing things about him. Plus I'm excited about the fundraiser Katie did to celebrate the release of her book. Natalie, so glad to hear things have turned around for you. May 2016 be an awesome year for you. Kathy, I love your 87 revisions answer. It's so simple (lol) and true! Natalie, so happy to hear life is full of happiness for you now. I know you had some really rough times and it thrills me to hear how happy things are for you. What a way to start the new year! And, Kathy, your book sounds amazing. I, too, was inspire by JK Rowling and wrote my first fantasy because of it. It , too, had be through hundreds... not kidding of revisions, with another one to go. So I hope I have the same happy ending as you. This one's been on my TBR for a while! Sounds great. Appreciate the introduction to Kathy. I was a little surprised, too, at how long the publishing process can take. So we get better at cultivating patience, right? :) I'll pass on the giveaway this time around. Have a great rest of the week! I didn't begin reading Harry Potter until the last movie was about to come out. Then I read the entire series straight through. Twice. I read the books in church and at work and late into the night. What an inspiration that series turned out to be. I loved hearing from Kathy. So interesting to learn more about authors and where their stories come from. I really like this cover! Wishing Kathy the best of luck! Happy New Year, Literary Rambles! Wow, even close to 87 revisions is unbelievable! I'm sure all of your hard work has paid off, Kathy! Natalie, I'm so glad that good things are happening for you. Your new job sounds great, and maybe the pay will increase when they realize how invaluable you are. I'm also glad that your daughter is happy at school and that you're in a wonderful relationship. I can't even imagine what is was like for you to lose your husband, and I admire you for having the strength and courage to move on in such a positive way for your family. Happy New Year, Natalie! I've had the same happen to me: horrible things all at once and then doors open and life lightens up. Happy 2016. I'm pleased to read about Kathy and her upcoming book. Congrats to her. Natalie, I'm so thrilled your 2016 is looking up, and that you're happy. Also fun to see so many 16ers coming up on the blog. I had a chance to read Kathy's ARC already, so you don't need to enter me into the contest, but I can vouch that it's a wonderful story--and the time she spent on worldbuilding definitely shows. 2015 was such a hard year for you in so many ways, Natalie. I'm beyond happy that 2016 is starting out promising and exciting! You deserve it. And congrats to Kathy on Sword and Verse. I love that cover and will definitely be checking the book out! I cannot wait to read this one! I would love to be the winner! ;) Thanks for the great Giveaway! Totally on my Goodreads list! And will Tweet too!